I have never had a sister. Growing up, I really didn’t mind, as I am kind of an over dramatic middle child who felt that having all the attention as the only female child was her exact due. Admit it, none of you are actually surprised by this. My mom and I are super close, and I have always had amazing girlfriends, so not having a sister was never really missing from my life. But when I started dating James, I also started becoming friends with his sister, likewise the lone girl in a family of rowdy brothers. When Laura came to stay with me in Paris for a week, we came to the point where we had the I-love-you-so-much-that-I-want-you-in-my-wedding-even-if-your-brother-and-I-break-up conversation. The fact that my entire apartment was only ten square meters, so I had to shower right above where she was sleeping certainly helped accelerate our closeness. Luckily, James and I never did break up, and we have just gotten closer until I really do feel like I have a sister. When we showed up in Cincinnati for her wedding last Friday, I glanced at the programs that she had just printed and I saw my name accompanied by “matron of honor, sister.” I promptly started crying, something that would repeat itself over and over throughout the weekend. Laura hired an amazing and super sweet photographer for her wedding, but I was that obnoxious member of the wedding party that dragged along her own camera because I am too impatient to wait for the real pics. I am already dying to see the awesome pictures that I know Vanessa took, but in the meantime, here are a couple snapshots from the weekend! The wedding was on Sunday (exactly one year and one week after she caught the bouquet at my wedding… just sayin.’ ; ) ), so on Saturday we started the weekend with a bridal tea at The BonBonerie. People, there is nothing I love more than a tea party. Oh wait, yes there is: a tea party where we all wear obscenely large hats. After a rehearsal dinner with lots of tears (Disclaimer: I am a TOTAL SAP. If I don’t cry at your wedding… something is wrong. ), a night with way too little sleep as James was up practicing his speech (yep, more tears), it was on to the wedding day! She’s so beautiful that I can barely even handle it. Oh, and she is wearing my veil… that my granny made for my wedding. Yep, MORE TEARS. Just look at those two. I know what you are thinking: Hannah’s kids are going to have ridiculously attractive cousins. It’s true. And because I know you are dying to see it, behold James, Hannah, and Hannah’s Hair. This picture does not do justice to the sheer size and force of my amazing do. I am generally opposed to people misusing the adjective epic, but I might just have to employ it here. For as long as I have known Laura, she has been beautifying whatever space she occupies with whatever she can craft or rummage up. This wedding was basically the culmination of her entire personality. From the wildflowers we picked that morning to put in vases, to the paintings she did for guests to sign instead of a guestbook, the the endless strands of bunting that she made or the paper pinwheels, this wedding was perfectly her. Like she did for our wedding, James’ mom MADE all of the cakes. Just thinking about them makes my arteries clog a little, but they were so, so good. I am blessed beyond belief to be able to call that amazing, gracious, kind, but still sassy enough to be fun, woman, my sister. And after spending the weekend around David’s family and friends, I’m pretty sure that I am blessed to be able to include him in this family as well. This entry was posted in Uncategorized and tagged family, love, photography, wedding. Bookmark the permalink. 30 Responses to My sister’s wedding. The picture of David pretending to shove the cake in her face and her look is response is PRICELESS. Congrats to the whole family! It is SO Laura and SO David! i thought the same thing. she is quite obviously capable of effectively handling any shenanigans! : ) sweet pictures, hannah! I think it’s pretty nice that she wore your veil 🙂 Lovely photos! Is her dress a tiny bit pink?!?! I Think the dress was an ivory sort of blush deal, but it did have a pink sash! I originally thought that choice very bold, as I am super boring, but she ROCKED it, as she did basically every decision. As for the semantic quibble, I will just give you my cop-out response I do for every grammar thing: meh, now that I write in French more than in English, my grammar is very loosey goosey. : ) In this case, it would be applicable because the had never had implies didn’t have for a long time, but now it is over because I do. Let’s hope for no tragedy. They look so happy… and her dress is AMAZING! It was so perfect!! I always love when people go the big ball gown route. I’m the only girl in my family too….crossing my fingers I get a sweet sister by marriage someday! Love your hair! Goodness, this wedding was perfect, the people were perfect, your pictures are perfect. I don’t know if I love it or start crying for not being as perfect as all of it! I am serious and this is not ironic. Oh no — I don’t want to make you feel like that! 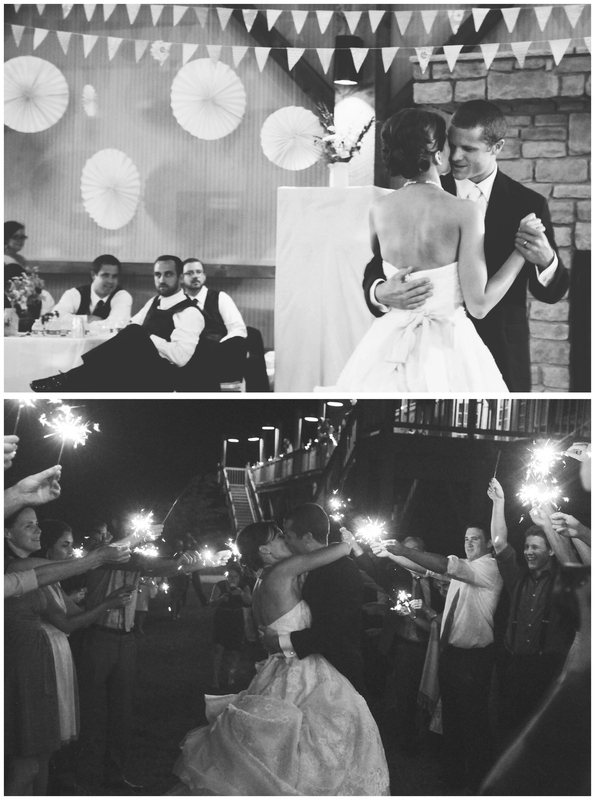 Every wedding that has happy people in love getting married is pretty perfect in my opinion. What a gorgeous wedding and a sweet story. You too beautiful photos too! Love, love, love these two. Some of my favorite people in the whole wide world!! Thank you for documenting and posting so soon!! Great photos. I LOVE the one of Laura and Elizabeth!! I cry at every wedding as well…total sap! And by the way, thank you for including that very last photo…I see that I made it in, well my arm…left side, bottom arm not attached to a visible body, sweater at the elbow. Perfect. I absolutely loved reading this–a beautiful piece for a beautiful bride. Was the reception at the Muhlhauser barn? Yes it was! Such a perfect venue! The photo of her having her makeup done looks very much like Audrey Hepburn! Your sister-in-law’s dress is exquisite! Believe me, that comparison was made multiple times throughout the weekend!